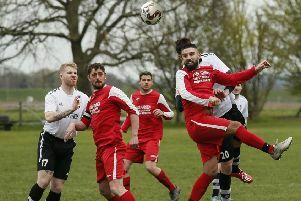 Kempston Rovers earned a second successive win at Southern League Division East basement boys Arlesey on Tuesday night, triumphing 4-0. A changed line-up for Kempston saw keeper Carl Knox make his first league start of the season and a slight reshuffle in the forward line to compensate for the absence of Jake Newman gave Jamaine Ivy the chance to lead the line. As early as the sixth minute Rovers took the lead in somewhat bizarre circumstances. A long ball down the right from George Boland found man of the match Sam Johnson who roasted his man and whipped in a cross. It seemed to go straight through the keeper’s hands as he looked to have it comfortably covered and was cleared by a defender after it came down off the bar. There was a brief moment of silence around the ground as the referee looked to his assistant. A flag was waved and the goal was given, Johnson the scorer, although Ivy was putting the pressure on the keeper from the cross and may well claim a touch too. Williams and Andrews had long-range efforts for the hosts, but didn’t trouble Knox. Josh Crawley had a shot fly wide before Seb Simpson headed just past the post from a corner. Ivy could have doubled the lead when his close-range shot from a Jordan Lee cross was smothered by the impressive home keeper Lewis Elsom. Ash Fuller and Ben Shepherd had further chances before the break, but the score remained 1-0. Rovers started the second half as the had played most of the first, on the front foot and creating chances. Ivy and Johnson went close before the lead was doubled on the hour mark. Fuller had a shot blocked in the area, the rebound fell to Crawley and he turned the ball across goal for Johnson to bundle in at the far post, although on first viewing it looked to be an own goal. In the 78th minute, Rovers made the game safe. Ivy had a shot blocked, Johnson picked up the loose ball and sent it back into the area, where it bounced in off the luckless Khan at the far post for 3-0. Two minutes later, Luke Heneghan was tripped in the area after neat build-up play. Ben Shepherd duly dispatched the penalty – Rovers’ first of the season – low to the right of the keeper. The scoresheet wasn’t troubled any further in the game, thanks in large part to Elsom – a work experience loanee from Peterborough United. The young stopper made a number of top-drawer saves to keep the score down and surely must have taken the home side’s man of the match award. Rovers travel to Fleet this Saturday before hosting Barton Rovers on Saturday, December 9. Rovers: Knox, Boland, Lee, Goodman, Simpson, McNulty, Fuller, Shepherd, Ivy, Johnson, Crawley.